← How to convert from a color or grayscale PDF file to black and white TIFF or PDF file? 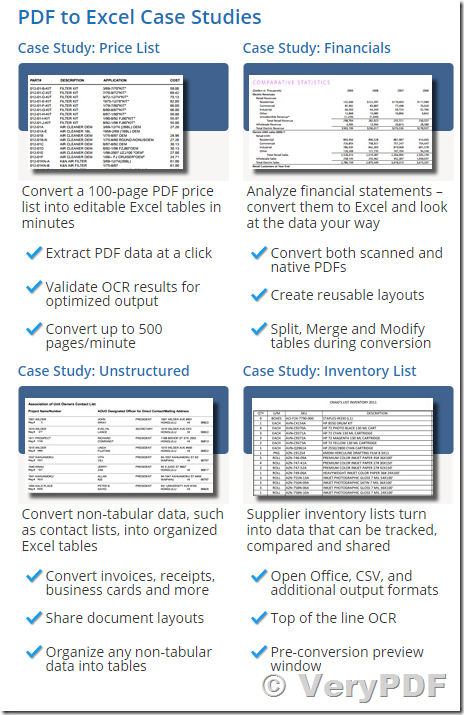 Convert ANYTHING to Excel, CSV and More. Convert ANYTHING to Scan to Excel OCR Converter with a virtual printer – Scan to Excel OCR Converter adds our VeryPDF Virtual Printer to your computer so you can send anything that you can print directly into Scan to Excel OCR Converter for processing – images, web sites, proprietary software, third-party software and more. Convert Scanned PDF file with error correction control – Scan to Excel OCR Converter supports scanned and image based PDF files and gives you a simple to use interface to control OCR corrections when necessary. Sometimes even a computer needs to make sure the letter 'O' is not the number zero. Convert JPG, BMP, PNG and other image formats with error correction control – With our built-in OCR technology and error correction control, Scan to Excel OCR Converter also supports full conversion for standard image files so you can convert your existing image library. Convert long PDF files by applying a "Single Page Structure" to multiple pages – By re-applying a single "page structure", Scan to Excel OCR Converter allows you to convert PDF files of any size. Supports scanning directly into Excel – Scan to Excel OCR Converter allows you to streamline your workflow and scan your documents (Faxes, Printed Reports, Letters and Much More) directly into the software for quick conversion so you don’t need to worry about handling more than one scanner software. Save time and convert up to 500 pages per minute – Scan to Excel OCR Converter allows you to convert multiple pages and multiple documents at a speed of up to 500 pages per minute, which means that even the longest files and batch directories will be converted in minutes. Convert scanned documents in over 30 languages – English, Spanish, Chinese, German, French, Italian, Portuguese and more – Scan to Excel OCR Converter OCR includes over 30 OCR dictionaries to ensure that scanned text is converted accurately in your local language. Multilingual User Interface – Scan to Excel OCR Converter User Interface (UI) is available in Spanish, Portuguese, Italian, German, French and Dutch, making it easy for you to use Scan to Excel OCR Converter in your native language. Use your PDF data in a variety of applications – Aside from Excel, Scan to Excel OCR Converter will extract the data to a CSV file (comma separated values) so that it can be uploaded into other applications. You can also export data directly into Microsoft Word, copy it to the clipboard, and to other formats. And Much More – For Example, Scan to Excel OCR Converter allows you to use "layouts" you created for one PDF document to instantly convert other (similar) documents. 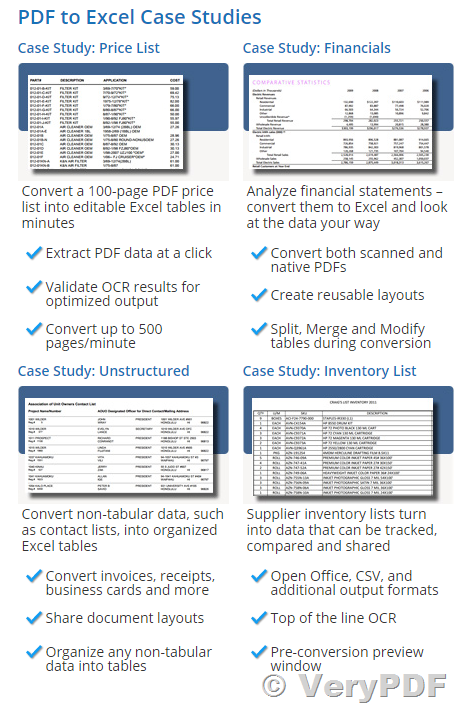 Scan to Excel OCR Converter also allows you to work efficiently by using over 20 "little" productivity features. This entry was posted in PDF to Excel Converter, PDF to Excel OCR Converter and tagged ocr pdf, ocr to excel, PDF to Excel, pdf to ocr, scan to excel. Bookmark the permalink.